Hope Valley Speculator is a 15hh stallion who is a grandson of the Nijinsky that won the Derby! He has a super temperament and lives with his mares all the time. Thankyou to Carole Cattle (UK) for sharing this and other photos with us. 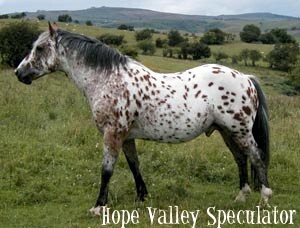 Carole specialises in breeding spotted horses, most of which are Thoroughbred crosses. Many of her youngsters have gone on to do dressage, jumping and Le trec.